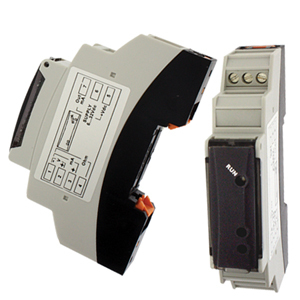 User Configurable via TX400-RFID (NFC) Programmer with PC software or Free Download Google App - "Direct Link"
The TXDIN401 and TXDIN402 DIN rail mount transmitters transform a temperature or process signal into a linearized 2-wire loop-powered 4 to 20 mA output. Model TXDIN401 is a temperature transmitter that accepts Pt100 or Ni100 RTD and Types J/K/T/E/R/S/B/N thermocouples. Model TXDIN402 is a process input transmitter that accepts voltage, current or resistance input. The characteristics of these converters ensure high precision on the reading scale with 16-bit conversion. The 4 to 20 mA output can be scaled based on the desired input range. The programming procedure uses an RFID (NFC) mode with the dedicated TX400-RFID programmer that allows the user to make all calibrations and settings quickly and without the need to power and connect up the transmitter. Simply connect the TX400-RFID programmer to the USB port of your PC, start the RF Programmer configuration software and place the transmitter on top of the TX400-RFID programmer to establish communications. These transmitters are also provided with a data logging function for the input signal. Transmitters have a non-volatile memory (circular buffer) for data-logging with user-selectable sampling time. The user selects the sampling time (1 to 3600 seconds) and then each time the 4 to 20 mA loop powers the device, the input value is stored to non-volatile memory. An additional programming tool is the Omega Brand Google App - "Direct Link" relying on RFID/NFC connectivity and allowing straightforward programming without wirings by Android devices. TX400-RFID programmer is supplied with complete User Guide and USB interface cable. TXDIN401 and TXDIN402 transmitters are supplied with complete User Guide. The RF programmer PC configuration software is a free download from OMEGA. Google App "Direct Link" can be free downloaded from Google Store or get a copy from our software link here.